The Republic of Benin (formerly Dahomey) is a country in West Africa. The population is about 8.5 million, a third of which live below the international poverty line of USD $1.25 per day. Benin's official language is French, reflecting its colonial history. 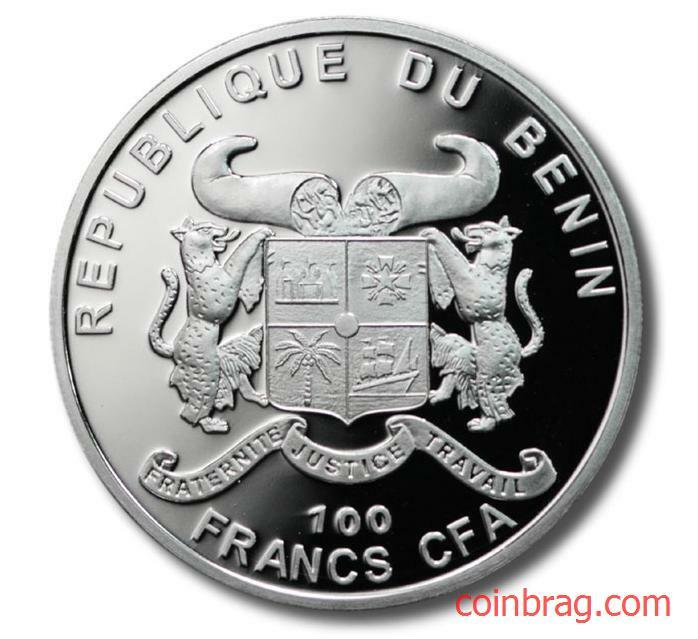 The 2010 Benin 100 Francs coin is made from a copper-nickel planchet plated in silver. It weighs 27 grams and is 38.61 millimeters in diameter with a reeded edge. This coin is special for a variety of reasons. 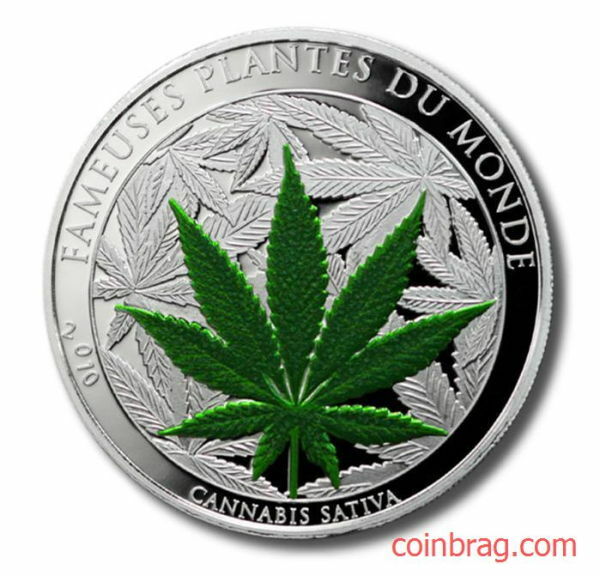 This coin is first to feature a cannabis sativa, a marijuana plant on the obverse and in rich color. If that was not controversial enough, the coin is also scratch and sniff. Although, no actual marijuana was used to create the scent. This means you can legally own it and the dogs at customs shouldn't give your package a second thought. You can see the ingredients here. The coin is the first in a series of coins titled, "Famous Plants of the World." Future coins will include a Rose and a Lily. Each fragrance has been developed by a professional perfumer using a chemical formula to replicate or reproduce the odor of the famous plant in question. Although it is a scratch and sniff coin, I'm told you can actually smell the scent without actually touching the coin. But be warned, if you were to rub the coin, after about 40 rubbings the scent will fade. The reverse has the official Coat of Arms of the African Republic of Benin. The current appearance being readopted into current use since 1990. The top of the emblem has the national crest consisting of two horns with corn in the ear and filled with sand which stand for prosperity. Below the crest is a shield that contains the actual coat of arms of Benin. The shield is broken into four quadrants. The top left quadrant contains a castle, representative of the history of Benin. In the top right quadrant, is the Star of Benin, the highest award of the nation. Below this is a ship, that stands for the arrival of Europeans in Benin. In the lower left quadrant is a palm tree which stands (yes, I know that was bad). I could not get any information on the symbolism of the palm tree. Perhaps that is their national tree? The shield is supported by a pair of leopards, the national animal of Benin. Below the shield is the motto of Benin "Fraternite, Justice, Travail"(French for "Brotherhood, Justice, Work"). At first I thought, "Work?! What a horrible motto!" My second thought was more careful and upon consideration I like it. Without getting too political, I'll just say that being a country is constant work. It does not always have to be a burden though. It can also be like the work one puts into something they love, like coin collecting. As far as investing goes, I'm not sure what will happen with this coin. It's only silver plated, so the intrinsic value is small. Melt value is not the only means for a coin to have value though. This coin is likely to appeal to as many non-coin collectors as it will to collectors and with only 2500 minted, these could definitely rise in value. Unconfirmed reports suggest that the mint has already sold out. The original retail price of the coin was $70 yet eBay is showing winning bids in the $44-$76 range. See the Completed Listings for yourself. Will this coin be available for $20 at the flea market in 3 years or will dealers be taking in $200 per coin? Comment below with your predictions and other thoughts.